Growing-up baking was something I loved doing. My mother was a great cook, but her baking skills were hit or miss. Case in point the first time I brought my husband back to Seattle to visit my mother was hosting a Christmas Eve party. She insisted that I should add an entire bag of raspberry flavored chocolate chips to the delicious brownies I was preparing. I was skeptical and said so, but my mother won out. They were terrible. The whole night I spend hovering over the desserts explaining that I had made everything, except the decision to put raspberry chips in the brownies. I look back at this story now that my mother has passed and laugh. She was a great mom in many ways, but not a great baker. Luckily I taught myself to bake when I was very young by trying every recipe in my mom's old cookbooks until they came out right. There were many cookie misses that had to be thrown out, but eventually I learned to cook everything in all the cookbooks. In college I made cookie platters until the early morning hours for co-workers, friends and families on their birthdays. How I found time for it still amazes me. My sweet tooth has stayed with me through the years, even though many other things have changed. This weekend I was in a baking mood so I decided to make gluten free cookies. I tried a new recipe for Salty Chocolate Chunk Cookies from the January 2013 issue of Bon Appetit magazine. This recipe has 13 ingredients. It takes 30 minutes of total time, 18 minutes of which is active and makes 24 cookies. I had no problems finding any of the ingredients at my local grocery store. Since I eat gluten free I substituted gluten free flour for the all-purpose flour used in the recipe. Additionally for the chocolate I used an 8 oz bittersweet baking bar. I found that since I made these cookies gluten free they took slightly longer to cook than the recipe suggested. They also spread out thinner, which is normal for gluten free baking. Make sure to bake the cookies on parchment paper. It really does make a difference on how evenly the cookies bake and makes it much easier to release the cookies from the pan. I followed the remainder of the recipe as written. I really liked the combination of salty and sweet in this recipe. My husband and I were both skeptical of how the salt would taste with the chocolate, but were pleasantly surprised by how delicious the cookies turned out. Since I made my cookies gluten free they were thinner and flatter than they would be with wheat flour. Either way they would be delicious. 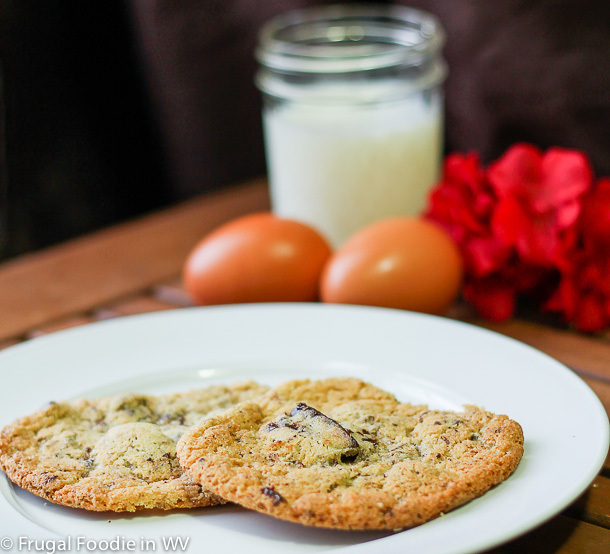 For the recipe go to Salty Chocolate Chunk Cookies. Salty and chocolate go together great! Definitely :) Anything with chocolate works for me!! Thanks for the sweet comments :) I'm going over to check out your blog now! Come back again soon! Yummy! I love salty and sweet together. This looks and sounds like a great recipe! I love salty and sweet together also, it's the perfect snack combo! My mother was a great cook, but her baking wasn't as great :) It took a lot of misses before I taught myself to bake well, luckily my family was patient! I love salty and sweet combos! You can never go wrong! Thanks for the follow!